Why is Brushing Your Cat a Good Idea? Brushing your cat is one of the main things you need to do to keep him or happy and well-groomed. It also provides you the opportunity to bond with your cat and to give her body a check up to make sure there are no problems. Cat grooming can be a pleasant experience for both you and your cat, especially if you start while your cat is young so he can get used to the idea. Cat brushing is a particularly good idea for long-haired cats and semi-longhaired cats, although short-haired cats should be groomed as well. Your older cat may lose some of his or her motivation or flexibility and may need a little extra help. Helping your cat or kitten to remove excessive cat hair also helps to minimize fur balls (hairballs) that can accumulate in your cat's digestive system. 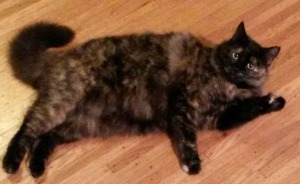 Usually, cats will automatically throw up or pass through hairballs. But occasionally, the fur solidifies into a pellet and can become stuck in your cat's intestines. In extreme cases, this will call for a visit to the veterinarian and can be a quite serious condition. Your hands are the first tools. Removing excess cat hair can be accomplished simply by stroking your cat with your hand. This also provides a polishing action that helps to give your cat’s coat a nice, healthy sheen. The extra cat grooming tools you'll need depend on the type of coat your cat has. You may want to ask a professional groomer for the tools they use, and you'll also discover for yourself what works best. 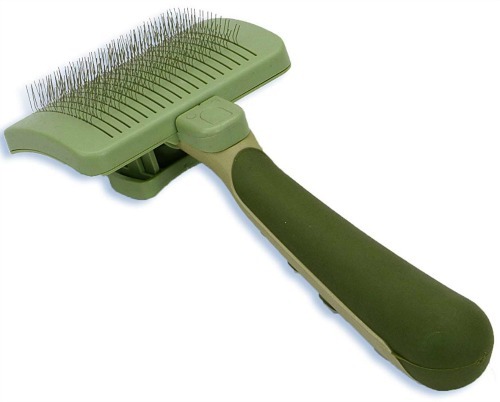 You can find many different kinds of cat brushes and cat grooming tools at your local pet store and online. They range from soft, rubber-bristled brushes to wide-toothed metal combs to cat grooming gloves. Try them out and see what works best for your cat and you. Amazon has a ton of different brushes you can try, but I like this basic inexpensive brush. Talk soothingly to your cat while you are grooming him. Make it a pleasurable experience and reward your cat with a play session or, occasionally, with a healthy cat treat. You can place a towel across your legs and gently settle your kitty on your lap to start brushing your cat. Make sure you have everything you need ready before you start. Try to brush as many parts of your cat's body as he will let you. You can start at his head and work your way to his tail (don't forget his belly), but you can also see what seems to work best for you. If you can't get it all done in one sitting, that's alright, you can finish later or another day. You don't want to force your cat or kitten, or it will never be pleasant experience for either of you. When Should You Brush Your Cat? You should start brushing your cat or kitten soon after she becomes a part of your family. Getting your kitten accustomed to grooming will help her to bond with you and also get her used to the experience. Choose a quiet time when your cat or kitten is relaxed. If your cat doesn't want to sit for the whole session, no problem, you can continue another time. It's best not to force it. You want this to be a pleasurable experience for both of you. How Often Is Brushing Your Cat Necessary? Shorthaired Cats - This may only be necessary a couple of times a week, depending on your cat. Longhaired Cats and Semi-longhaired Cats - These kitties should, ideally, be groomed once a day. In addition to preventing troublesome hairballs, this will also prevent matted cat fur that can be really hard to take care of, and it will make it easier to keep your furniture a little more fur-free. 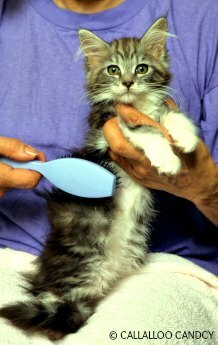 Cat Grooming Techniques - Information on other cat grooming methods, including feline bathing and clipping nails.